They say the art of simplicity is a puzzle of complexity, and this timekeeper is no exception. The annual calendar offers a mechanical solution of the utmost elegance, favoring technological simplicity and ease of use. Simplicity is the hardest thing to achieve. It is the ultimate test of experience, the final push of genius. With the new Marine Chronograph Annual Calendar, Ulysse Nardin has successfully applied this new paradigm to premium watchmaking. The product of a quest for perfection, its annual calendar offers a mechanical solution of disconcerting purity. Simple to use, adjustable both on the front and back, this piece is imbued with the values of innovation, reliability and high-precision that are so cherished by the watchmaker. Its UN-153 calibre is entirely manufactured in-house—including the silicium balance-spring. Halfway between a perpetual calendar, which doesn’t need correcting before the year 2100, and a simple calendar that requires five manual adjustments a year, the annual calendar is mechanically programmed for one year: it recognises months composed of 30 and 31 days, but not February. It therefore only needs to be corrected once a year. 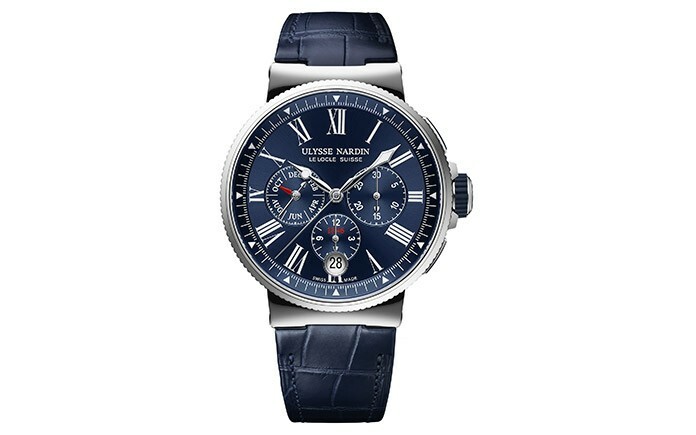 But where classic devices involve up to thirty components, watchmakers at Ulysse Nardin have managed to develop a system containing around only a dozen elements. In a development of the simple calendar developed for the UN-118 caliber, the annual calendar needed only three additional wheels—a challenge that personifies the spirit of Ludwig Oechslin, the genius creator for whom simplicity is a philosophy. The new UN-153 caliber is manufactured entirely in-house and beats at 28,800 vibrations per hour, proof of its extreme precision. As for the silicon balance-spring and escapement, they are provided by the company Sigatec, which is co-owned by Ulysse Nardin. This particularly well designed movement allows the time and calendar pointers to be moved in either direction. 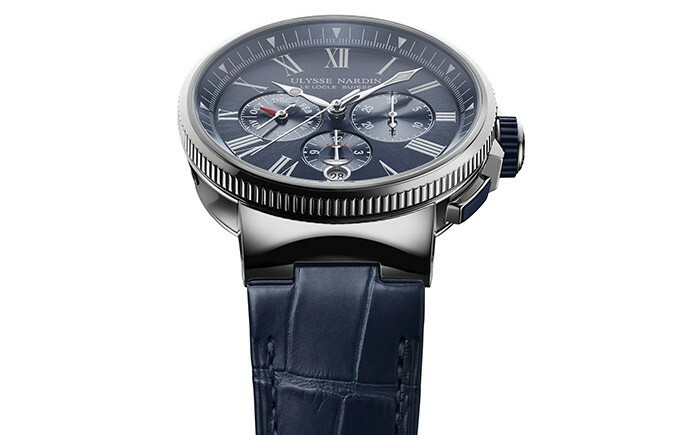 The model also includes a chronograph feature. Apart from the central hands indicating the hours, minutes, and seconds, the 30-minute counter is displayed at 3 o’clock, the hour counter at 6 o’clock and the small second counter at 9 o’clock. The latter also features a month display, which includes sub-dials offering useful guide-marks when setting. Finally, the date is displayed in a window at 6 o’clock. A worthy inheritor of the lineage established by the Marine Chronometer Manufacture (2012) and the Marine Chronograph Manufacture (2013) models, the Marine Chronograph Annual Calendar bears the same outstanding classic forms as sailing instruments, including a ribbed bezel, a screw-crown guaranteeing perfect water- resistance, a full lug width ensuring admirable stability on the wrist and a generous 43 mm diameter case for excellent readability. An incarnation of the extraordinary history of the manufacturer, equipped with the latest technological advances in chronometry, this new model for 2016 conveys the ever vibrant spirit of Ulysse Nardin.